People do not typically watch science fiction movies with the intention of unraveling the scientific mysteries behind their spectacular scenes such as superheroesÃ¢ÂÂ preposterous exploits, dizzying spaceship voyages, and apocalyptic weapons. However, some people like to explore the possibility of HollywoodÃ¢ÂÂs crazy ideas becoming reality. Could Superman really shape a planet to make it cubic instead of spherical? Is science able to give life to monsters such as Frankenstein? Are we in danger of being attacked by something from space? This book addresses these questions and more from a scientific point of view. 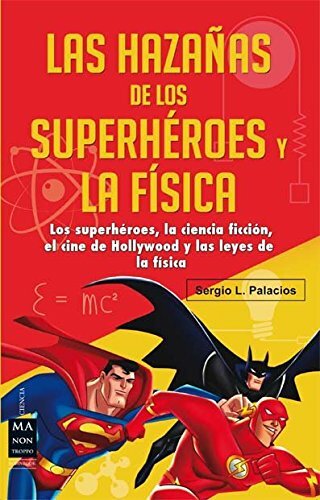 from Robinbook (July 1, 2016); titled "Las hazaÃ±as de los superhÃ©roes y la fÃ­sica: Ciencia FicciÃ³n, SuperhÃ©roes, El Cine De Hollywood Y Las Leyes De La FÃ­sica"
About: People do not typically watch science fiction movies with the intention of unraveling the scientific mysteries behind their spectacular scenes such as superheroesâ preposterous exploits, dizzying spaceship voyages, and apocalyptic weapons.